Sorry, been so lazy with the blogging lately! I've had several meals that I forgot to blog about and here's one of them. 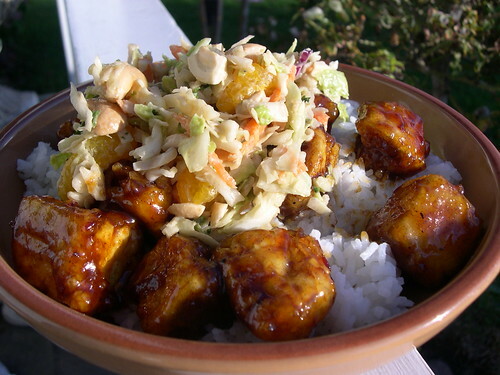 It's fried tofu with a tamarind/hoisin glaze. That's coleslaw on top. 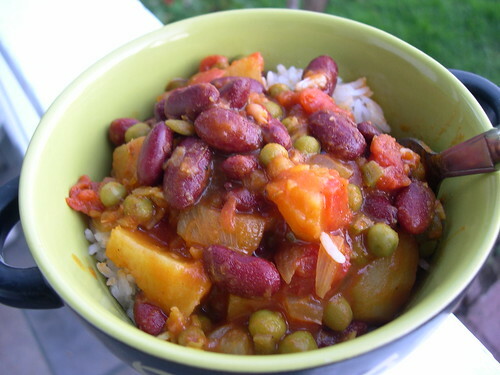 Kidney bean curry when I was craving indian food. 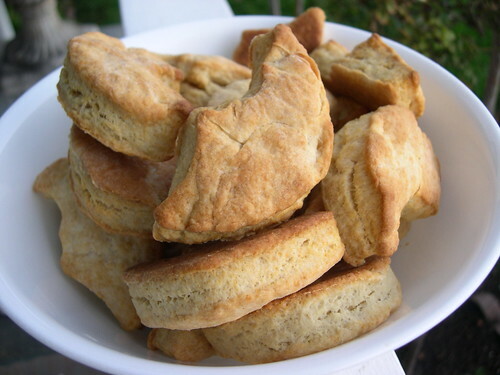 Deeelicious flaky and tender biscuits! They are great on their own and perfect with margarine and jam. Me+tea+biscuits=happiness. in a bowl or food processor, combine flour, baking powder, baking soda, salt. cut in the shortening with your fingertips or a pastry blender until the mixture resembles coarse bread crumbs. (I used a fork) Add soymilk/vinegar and stir just until the mixture sticks together. Turn the dough out onto a lightly floured surface and knead lightly and quickly, about 30 seconds. using a lightly floured rolling pin, roll out about 1/2 inch thick. using a floured 2 1/2 inch round biscuit cutter, cut out circles. Place onto the prepped baking sheet. Bake until lightly browned, 10-12 minutes. Serve piping hot. I got about 10 biscuits out of this, plus a bunch of loose ends that I'm saving in the freezer to use as dumplings. Chili Dogs and Chinese Chicken Salad with No Chicken. 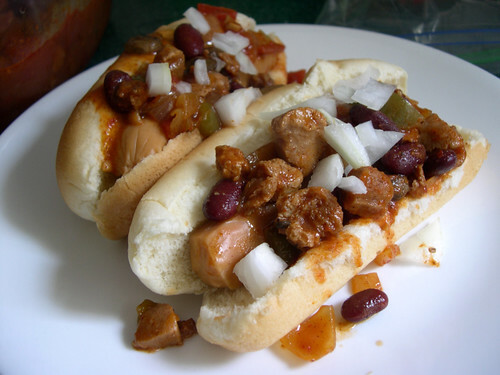 Yesterday's chili made fantastic meaty chili dogs! YUM! Veggie dogs are Lightlife Smart Dog brand which I found at Albertson's. Didn't really go with my chili theme but I've been craving a good asian slaw with a spicy peanut sauce which had peanut butter, cayenne pepper, sesame oil, rice vinegar, cider vinegar, agave and soy sauce. 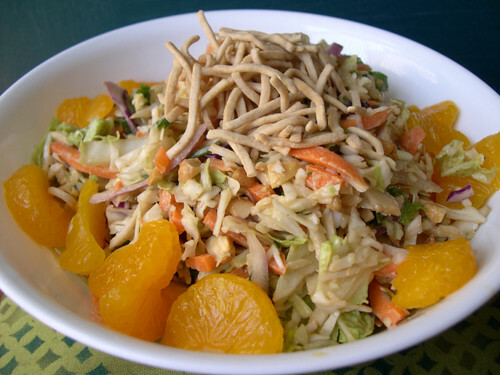 I made the salad with napa cabbage, green cabbage, carrots, cilantro, cashews, mandarin oranges and fried chow mein noodles. It was so fresh and tasty. Vegan Cowboy Chili and Cornbread. I know this is more fall food than summer food but really, who turns down a steaming bowl of chili with a slab of cornbread? 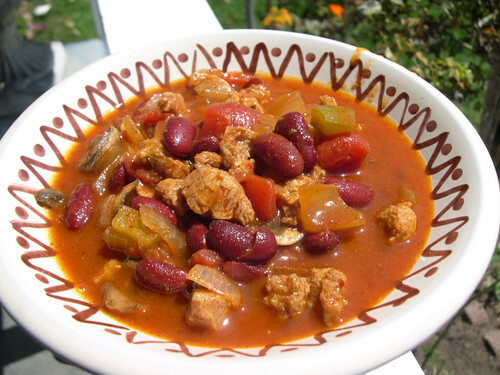 I've made this cowboy chili before. The trick is soaking dried chili peppers and pureeing them and adding the dark red emulsion into the chili. It creates a very complex flavor with some great heat. For the "meatiness", I used tvp chunks and tvp crumbles. Recipe here. 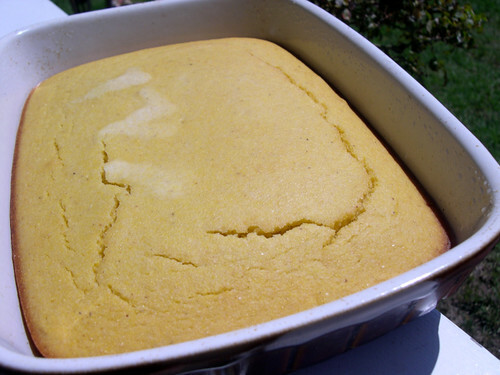 This is the famous PPK cornbread that I absolutely love. Makes good corn muffins too! Another Salad and Microwave Chocolate Cake! Wow, these salads at home are starting to get better and better. I've had three in three nights so far. 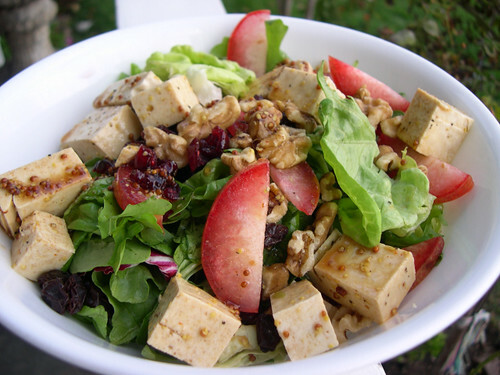 This one has butter lettuce, radicchio, arugula, tofu, cranberries, raisins, walnuts and pluots with a dijon/balsamic/sesame dressing. Was good. Ok, so this is for the desperate only. 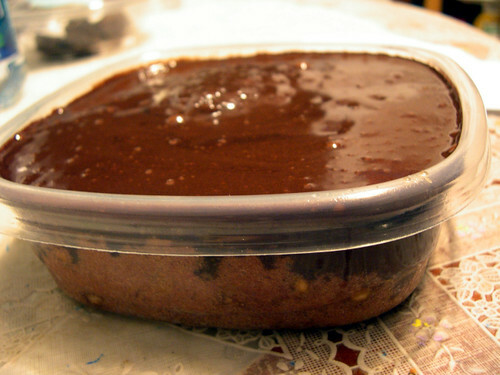 There's a recipe on vegweb called "Absolutely Divine Microwave Cake" and let me tell you, if you are craving something sweet and you have to have it now, then follow this recipe. I didn't have chocolate chips so I used dairy free white chocolate. I've made it with chocolate chips and it's better that way. My chocolate topping is Pillsbury dark chocolate fudge frosting melted in the microwave and poured on top. I know I know, microwaves are not the top choice to cook in but I was desperate! Yes, the macaroni is green. And here's why, the sauce is made from broccoli! 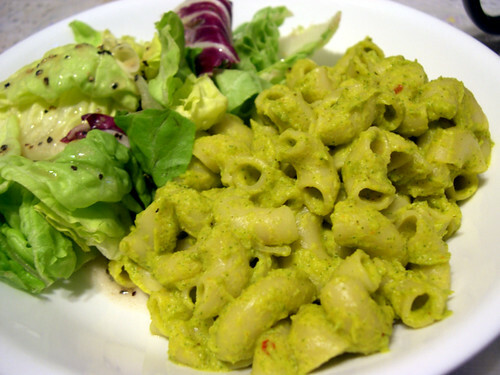 In The Veggie Lover's Cookbook, there's a recipe called Miso Macaroni that uses cooked broccoli and onions as a base for a sauce in which you add white miso, nutritional yeast, vegan margarine and tamari. I made a quick version by steaming broccoli, onions and sliced carrots in the microwave, threw them in the blender along with the other ingredients and blitzed away until smooth. Then heated up the sauce, added crushed chili flakes and tossed in cooked macaroni. Dinner took about 15-20 minutes. 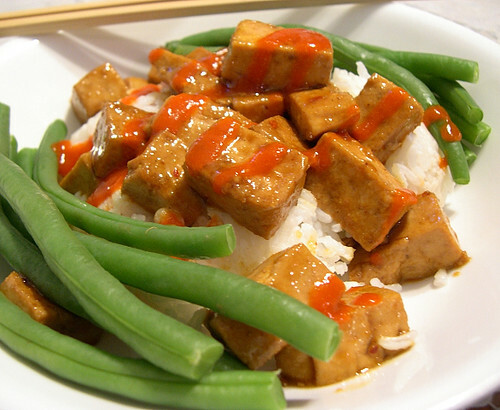 I wasn't initially in the mood for asian food but when faced with a block of tofu and a bag of green beans, this was the only thing I could come up with. I sauteed the tofu in olive oil, regular soy sauce, mushroom soy sauce, plum sauce, a splash of rice vinegar, garlic, sansho pepper and crushed chili flakes. Served with steamed green beans and rice with a healthy squirt of Sriracha. Pretty tasty if I do say so myself. I was in a baking mood last night at 8pm and made these on the fly. 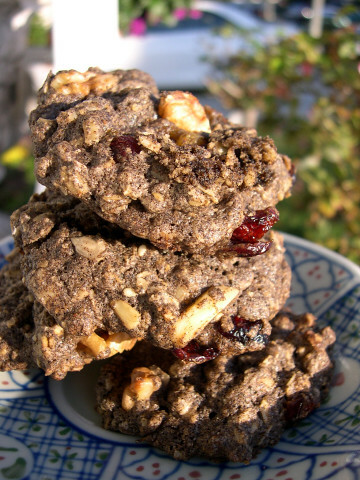 I wanted a somewhat healthy, hearty cookie and decided to use up the buckwheat flour that was hanging out in the fridge. I basically took a vegan oatmeal raisin cookie recipe and switched out the white flour for buckwheat. I definitely need to tweak this recipe because the cookies were very fragile and tended to fall apart if you pick them up. 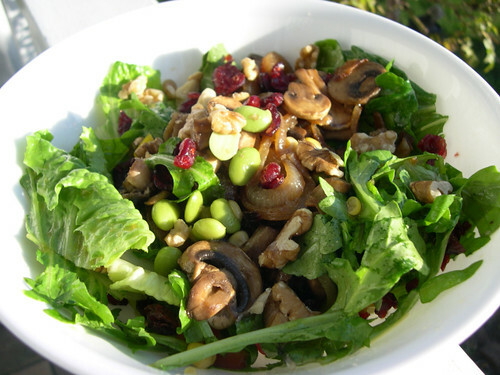 I added a bunch of healthy stuff like walnuts, almonds, sesame seeds, cranberries, sultanas and dark raisins. They're tasty but need work. 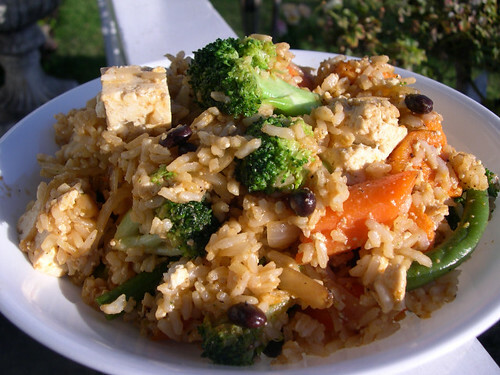 I whipped up this fried rice from last night's brown rice, the leftover veggies, added some broccoli, tofu, onions, garlic, ginger, mushroom soy sauce and ketchup. Threw it all into the wok on high and dinner was ready in minutes. 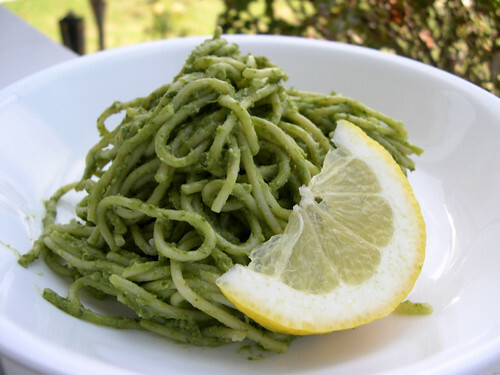 I made this dish over the weekend which was inspired by Giada DeLaurentis' avocado and arugula pesto. I made mine with less arugula, more basil and instead of parmesan, I used almonds and miso paste.